FunDeco | Color Ink, Inc.
With FunDeco’s new store, customers will be able to see and touch all products in a dorm-like setting similar to the pictured room above. 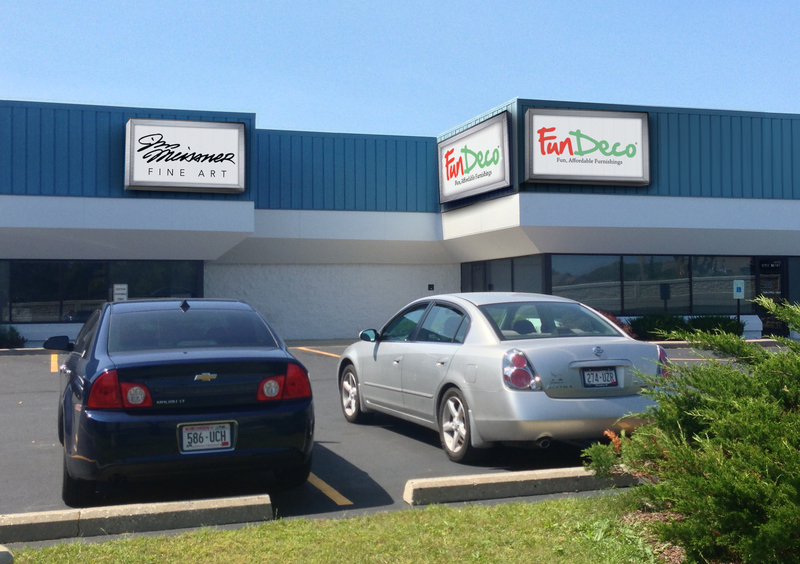 With the November 1 launch rapidly approaching, more details have surfaced regarding the FunDeco retail store set to open in Sussex, Wisconsin. Next to the sparkling new “Jim Meissner Fine Art” gallery, the FunDeco store will be a collegiate playground filled with the latest FunDeco innovations. Plans about the layout have begun to emerge. Customers who visit the store will enjoy numerous high-def televisions showing ESPNU or highlights from marquee football games, such as Wisconsin’s demolition of Nebraska in last season’s Big Ten Championship Game. There will be several set-ups featured as well. 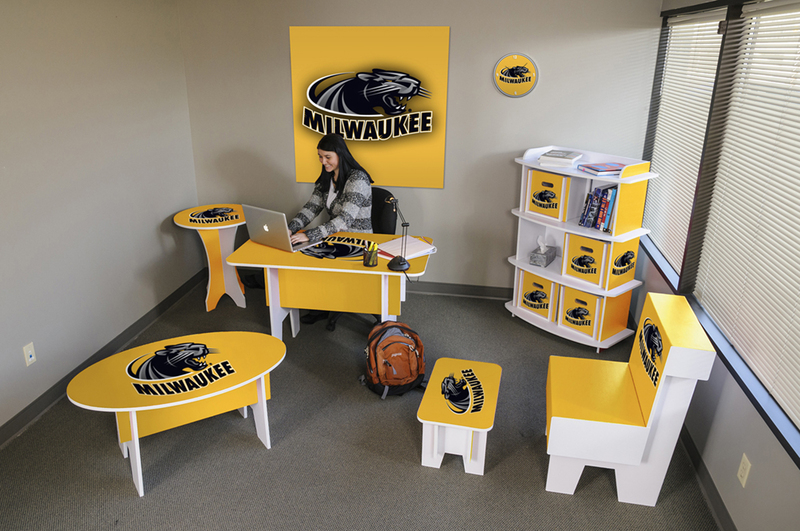 From a tailgate area packed with bars, chairs, and bean bag toss games to a sample dorm room set-up with storage bins, desks, and wall graphics, customers will be able to experience the full range of FunDeco products. There will also be a massive interactive touch screen to design custom items. 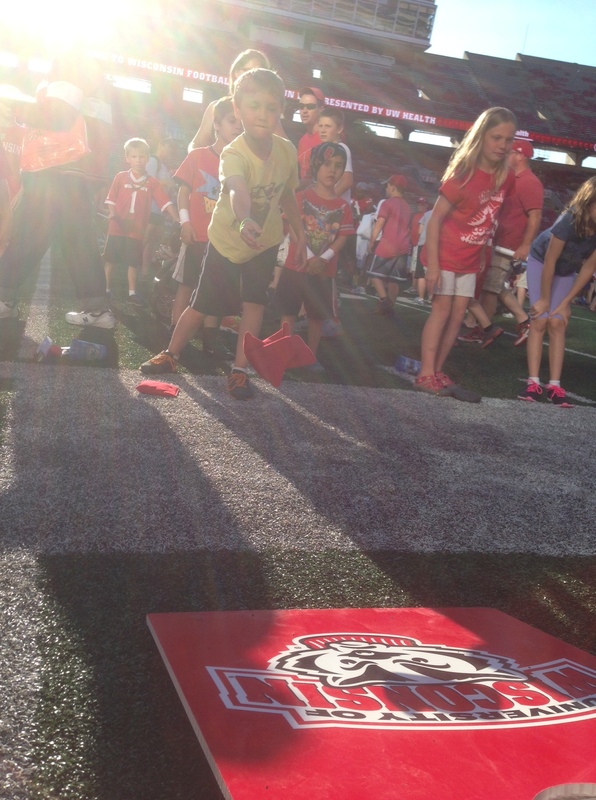 With prices lowered and football season officially in full swing, there has never been a better time to deck out your room, basement, or tailgate with FunDeco! 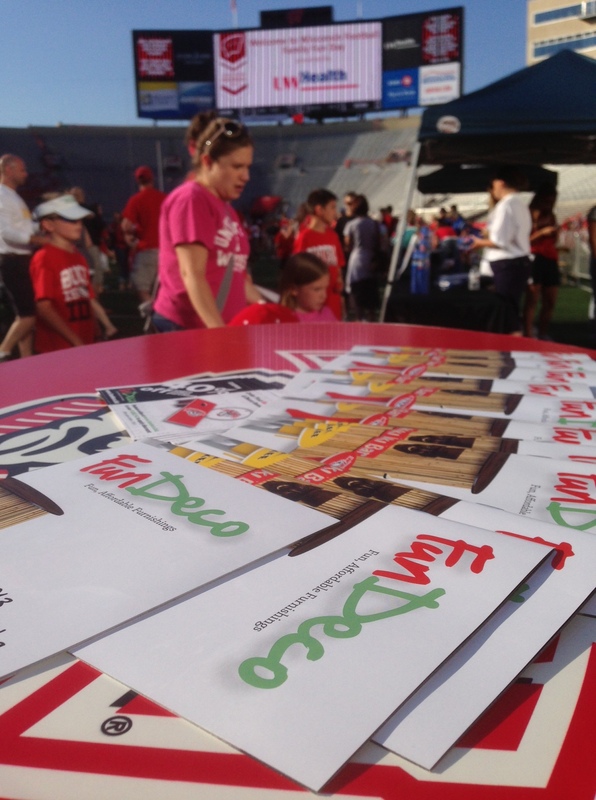 Stay up to date with all of FunDeco’s breaking news by following us on Twitter! 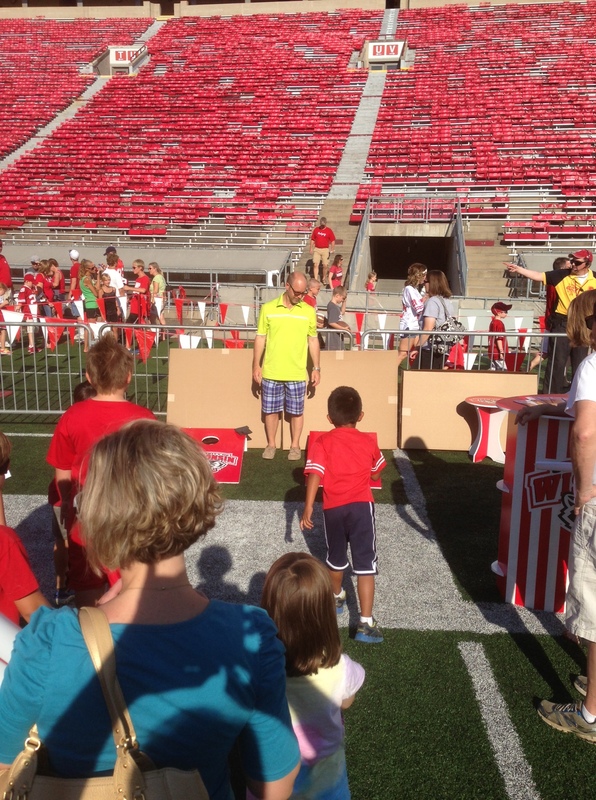 FunDeco President Todd Meissner watches as kids play bean bag toss with one of FunDeco’s many honeycomb products. 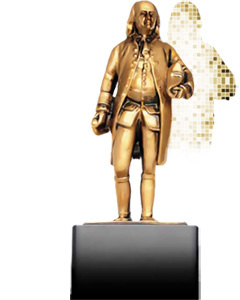 We are extremely proud to announce that FunDeco has won the 2013 Premier Print Award for Cross-Media Promotion! What does this mean, exactly? We get (another) Benny! FunDeco representatives will accept the prestigious award during the Premier Print Awards Gala in Chicago on September 8th. So how’d we earn this recognition? If you haven’t heard our commercial featuring Mike Golic on ESPN Radio, or have yet to see our semi cruising alongside you on the highway, or didn’t receive a custom postcard with pictures of your school’s items “FunDeco’d,” then you’ve got to check out our main social media pages below. All this and more combined to bring FunDeco a Benny! 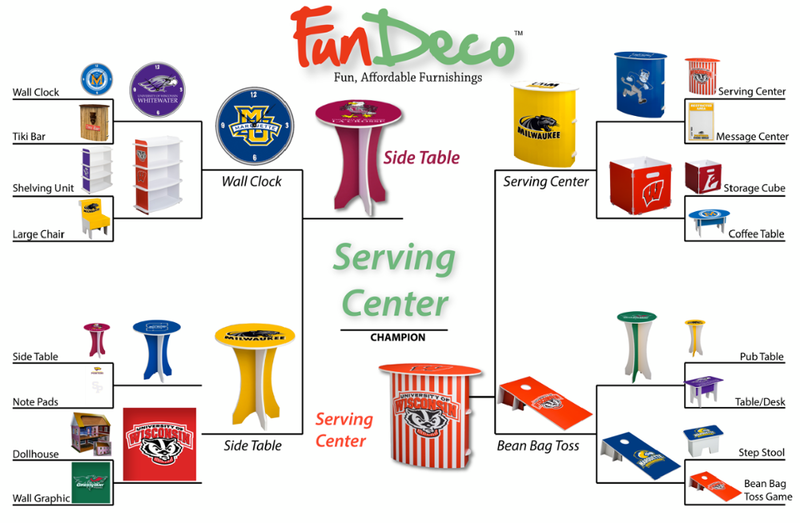 FunDeco is proud to announce a new, sleek-looking product: our Stadium Sports Chair! Taken from the blueprints of our original chair, our new design replicates the seating that you’d find at most sporting venues. 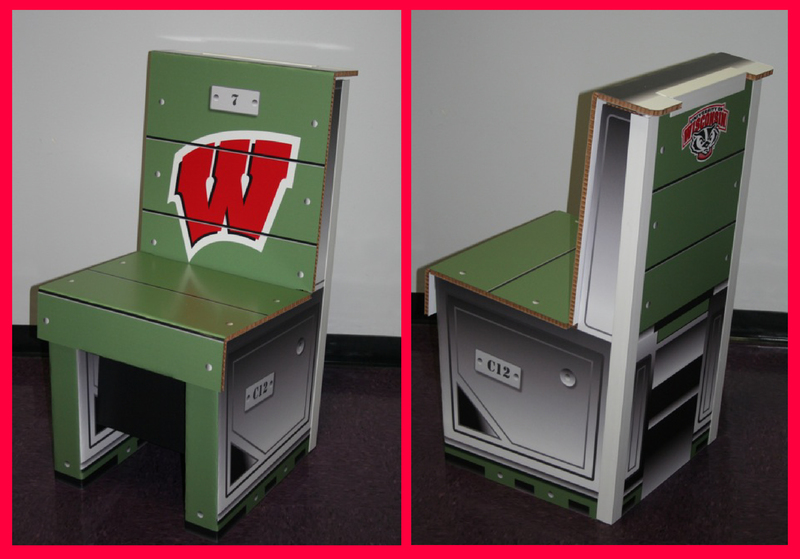 So kick back, relax, and enjoy the game with our awesome new Stadium Sports Chair! Color Ink had their most impressive showing ever at the 2013 Great Lakes Graphic Association Graphic Excellence Awards, taking home a whopping six Best of Category entries as well as seventeen Awards of Excellence. FunDeco, in particular, was a huge winner. The awards for Cross Media Promotion, Special Innovation in Printing, Digital Large Format, and Other Special Innovation all went to FunDeco. Below is the complete list of awards collected by Color Ink / FunDeco. Edging out the Side Table by the slimmest of margins, the Serving Center is your Champion. Look for a special promo code to celebrate this monumental victory!